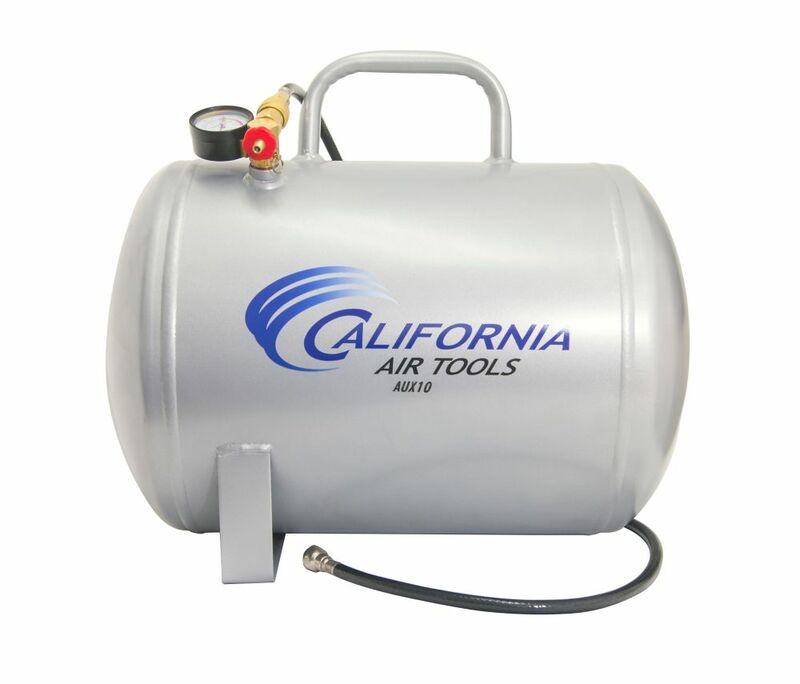 California Air Tools 10 Gallon SteelAuxiliary Air tank is designed for portability and easy to use. The lightweight and easy carry design makes transporting this air tank very easy. California Air Tools auxiliary air tanks are designed to provide an extra supply of airneeded for short-term demands such as inflating tires. These auxiliary air tanks provide stable pressure andaconstant air flow for purposes such as spray painting. Having the California Air Tools auxiliary air tank will allow you to have an extra supply of air for more time before the air compressor motor/pump starts to run. The Easy to Use Quick Connect Fittings on the Air Hose and Air Valve allows you to quickly attach the Air Hose toan air compressor and fill the auxiliary airtank without needing extra airfittings. This Easy to Use Quick Connect System also allows you to connect a standard air hose to your air valve for use with air tools. Industrial Air 20 gallon portable electric compressor features a dual-voltage motor for delivering air at up to 130 psi. The pre-attached, solid rubber wheels and handle allow it to be easily transported around a work area. This pump features 2 cast iron cylinders as well as aluminum cooling fins to help reduce heat buildup. AUX10 - 10 Gallon Portable Steel Air Tank California Air Tools 10 Gallon SteelAuxiliary Air tank is designed for portability and easy to use. The lightweight and easy carry design makes transporting this air tank very easy. California Air Tools auxiliary air tanks are designed to provide an extra supply of airneeded for short-term demands such as inflating tires. These auxiliary air tanks provide stable pressure andaconstant air flow for purposes such as spray painting. Having the California Air Tools auxiliary air tank will allow you to have an extra supply of air for more time before the air compressor motor/pump starts to run. The Easy to Use Quick Connect Fittings on the Air Hose and Air Valve allows you to quickly attach the Air Hose toan air compressor and fill the auxiliary airtank without needing extra airfittings. This Easy to Use Quick Connect System also allows you to connect a standard air hose to your air valve for use with air tools. AUX10 - 10 Gallon Portable Steel Air Tank is rated 4.5 out of 5 by 11. Rated 5 out of 5 by R60Robert from The air tank works great! I like the option that... The air tank works great! I like the option that you can attach other air powered tools to use with the tank. Rated 5 out of 5 by David from I bought this for a reserve tank only, so not... I bought this for a reserve tank only, so not much I can say. Rated 5 out of 5 by HANDYMAN from IT WAS A GOOD PRICE, SEEMS TO BE WELL BUILT. LIKE THE IDEA THAT YOU CAN SWITCH THE HOSE TO FILL T... IT WAS A GOOD PRICE, SEEMS TO BE WELL BUILT. LIKE THE IDEA THAT YOU CAN SWITCH THE HOSE TO FILL THE TANK THEN SWITCH IT BACK TO FILL YOUR TIRES ONLY ONE HOSE TO WORRY ABOUT. Rated 5 out of 5 by Brett from Great for the price. This is a decent quality, steel air tank. Works well as an auxilliary reservoir for my small compressor whilst spray painting. I haven't and don't plan to use the tire inflation hose that came with it, but it comes with a stanard NPT thread on the tank and some brass fittings that are relatively easy to hook up to any other standard compressor or air lines. Rated 4 out of 5 by Brian from Good PIG Much better than the old PIG I have. Seems to be very heavy construction and should last. Also like how it has a coupler connection for a hose (what you'd have on your tools) vs having to fill it with a typical valve stem style fitting. Rated 4 out of 5 by MidLife from Poor shipping, excellent product. My 10 gallon air tank arrived with the "foot" bent, causing it to wobble. I returned it to a local HD. I did order another one. You can't beat the features for the price. For the price of a cheap basic unit where the tire chuck is screwed into the tank, you get the quick connect air in and air out, with an in-line shut-off. I am using this to expand the capacity of my compressor. All you need is a short lead in hose, and then connect the main hose to the output.